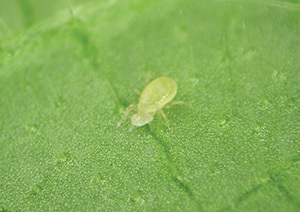 In May and June growers may have to deal with a thrips peak. Preventative release of the predatory mite Amblyseius swirskii in combination with Nutrimite™ is an effective answer. Growers of everbearing strawberry varieties better bear in mind that the end of spring and the beginning of summer are ideal periods for thrips to invade berry fields. The peak is usually observed around late May/early June”, depending on areas says Julien Mourrut-Salesse, Manager of the IPM and Pollination Specialists at Biobest. A rapid and massive pest attack requires an effective answer. In strawberry, the predatory mite Amblyseius swirskii is a trustworthy beneficial. When thrips are already present on the plants and fruits, A. swirskii actively looks for thrips on flowers, leaves and fruits. Besides, in the absence of thrips, the swirskii mite is also extremely useful. Thanks to the application of Nutrimite™, Biobest’s 100% natural food supplement made from a special selection of pollen, growers can bring their swirskii army at fighting strength before the pest arrives. Practically, Julien typically recommends one swirskii sachet per two (linear) meters of strawberry. Application of Nutrimite™ every 15 days will ensure a good installation of the mites. In some cases, a second introduction of swirskii may be useful. For more information, please contact Lise Verachtert (lise.verachtert@biobest.be).